From time to time during the academic year, it is useful (for all concerned) to deploy an automated email message that is able to reply on one’s behalf to all incoming messages: when one is away on annual leave, at a conference, or ill (academics are humans too and get ill, also due to our work including a lot of human contact); and at times of the year when email traffic is very heavy, it’s helpful, as a correspondent may be anxious, to send a quick reply first (be it automated or just short) to acknowledge receipt of a message and to explain that it will take a little longer to reply. Many of our university services do this, for example, giving a possible reply time of a few days or a week. One can also add some links to where answers to frequently-asked questions may be found. FAQs are only frequent for the recipient; for the person who is asking them, it’s usually the first time they’ve asked, these questions are often far from obvious, and finding information may be difficult. I don’t usually set up “out of office” emails to run for shorter recurring times like overnight, at the weekend, and on public holidays. Our institutional email system is set up so that one could, but I’d rather not do this in case a student emails in a genuine emergency. While I’m neither on 24-hour call (not only am I human, I’m one of these humans who need 8-10 hours’ sleep a night) nor a member of the emergency services, I do check email outside working hours just in case there are any urgent messages. And email is the way to do this. I do not share my own mobile telephone number or our home number with students (nor indeed with many other people), and I use my work ‘phone as little as possible (it has a message asking you to email me). No-one needs to have access to me for work reasons in private time. When at work, there is no reason why I should be immediately contactable and interruptible by telephone at any time at anyone else’s convenience. This is a matter of consideration, consultation, and consent. It’s also a matter of workplace health (disability, anxiety, stress, sensitivity to sounds like repeated ringing tones at certain pitches) and safety (aggressive calls, threats, harassment, sexual harassment). A further and practical reason not to answer a telephone the moment it rings: most cold calls, at work and at home and on my mobile, are irrelevant sales and marketing spam. I do sometimes answer the phone when working in my office (usually when I recognise department colleague numbers); it has never been anything that could not have been done in real live human person or in writing / by email. Urgency is a matter of judgement: that is, my judgement, in my time, taking the necessary time for thinking and sometimes also for research. If you are asking me a serious question about something that matters to you, I would like to be able to pay attention to it, and to you, properly and fully: just as I do for other work and for working in person with other people while teaching and in office hours. That is a further reason for not disrupting work and interrupting the other people concerned, whether they’re physically present (students in office hours, colleagues in a meeting, a whole class of students when teaching) or at the other end of an email; besides, such interruption is selfish, disrespectful, and rude. Today (Monday 14 January) is the last day for students to change their registration: adding and dropping classes, moving from one section of a multi-section course to another to fit with the rest of their schedules, figuring out what courses one should take. * That might seem urgent. Yet in many cases it is not. It is not a reason to expect special treatment if, for example, one sends an email at 8:36 p.m. on a Saturday evening or 4:48 p.m. this afternoon. Today is also the first day of the third week of term. 15% of term is over. 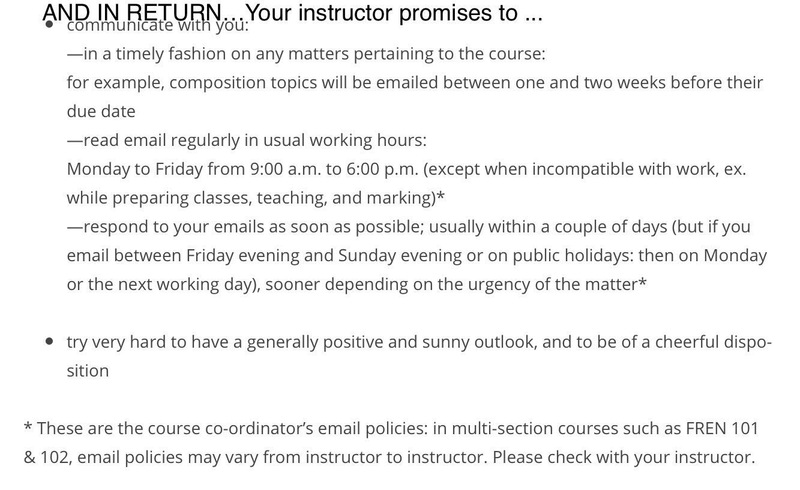 Course registration has been open for months. Students have had two weeks this term, and all of last term (and in some cases last year or several previous years as well), to work with academic advisors in their home faculty and in individual departments to sort out credit transfer, pre-requisites, placement at the right level, and so on. Meanwhile, our institution has policies on being a respectful workplace and has placed wellbeing as a priority in its strategic plan; that includes respect for, and the wellbeing of, faculty. So. I was thinking about bots. While academics who work in, on, and around literature may dream of applying our experience, training, expertise, and talents to creative writing, sometimes there are good reasons for us to stay in our lane. “Our lane,” as humanities faculty working within the larger sphere of philology, is “sense” and “meaning” on what Christine de Pizan nicely called a “path of long study”; and we work enough in collaboration with philosophers to have some idea of a “lane” that is the path of wisdom. Here, then, is a sort of short story in the form of an automated telephone option menu combined with automated email replies. It may be rearranged as a bingo card, recombined as a choose-your-own-adventure, or remixed as material for your own creative delight. It is a cautionary tale. I hope that it helps to explain why I’m not setting out-of-office email replies outside working hours every day, why we should think very carefully about chatbot design (even with the most sophisticated semantic, rhetorico-poetic, and sociolinguistic cue recognition that we have right now), and why such creatures should only be created by collaborative interdisciplinary teams: neither computer scientists alone, nor writers alone. We can return to this post in ten years’ time and laugh at it; may we all still be here in ten years, and may that be a “we” that includes non-human intelligences artificial, alien, and otherwise unimaginable other. 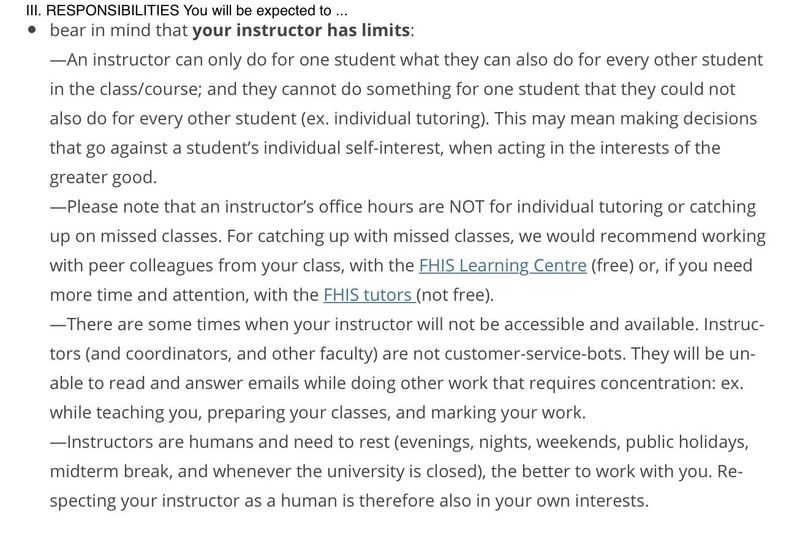 And now you know far too much about what university faculty do when they are not plugged into a classroom or their office computer.